YORKSHIRE’S Jonny Bairstow disclosed the difficulties which preceded his comeback century against Sri Lanka, revealing hours of rehabilitation, bad news from home and criticism all fed his emotional celebrations. Bairstow has only been out of the Test team for two matches, a football-related ankle injury sidelining him in Galle and the selectors’ reluctance to change a winning team keeping him out in Kandy. Yet the highly-charged reaction to his sixth hundred hinted at a deeper story – eyes bulging, bat and helmet discarded and a guttural holler of ‘yes’ seemingly combining to express pride, relief and a hint of righteous indignation. His 110 in fiercely humid conditions at Colombo’s Sinhalese Sports Club was a remarkable effort, particularly against a backdrop of his unexpected move to the problem position of No 3 and the loss of his cherished wicketkeeping duties to Ben Foakes. Speaking after England closed on 312-7, the 29-year-old appeared to still be battling with a number of rival feelings, both personal and professional. “You can take it how you want to see it,” he said of his celebration. “I’d like to hope I’ve come through most challenges along the way and I’m desperately proud. “You’ve got to sometimes take everything on the exterior: what people write, what people say, people’s opinions and park that. Sometimes you use it as a motivator but also it’s the internal drive of what you’re doing it for and who you’re doing it for, that goes a long way. “That’s the bit that means the most out there ... the days when things aren’t going well, for your mates back home that make sure everything’s OK.
“It’s the hard work you put in behind the scenes that no one sees. The sleeping on ice machines, the rehab you put in. It would’ve been quite easy to say, ‘I’m not fit’. Perspective came in the form of heartbreaking developments off the field. He explained: “Two friends have unfortunately passed away over the past couple of weeks. A lad that we played with on the academy at Yorkshire unfortunately passed away in his sleep and another friend of ours that we spent time with in Sydney passed away all of a sudden from a heart attack. Bairstow has his own opinions on the game too, of course, and clearly felt stung – either by the reaction to his injury or by his subsequent omission after working back to fitness. Quite possibly both. You’ve got to sometimes take everything on the exterior: what people write, what people say, people’s opinions and park that. Sometimes you use it as a motivator but also it’s the internal drive of what you’re doing it for and who you’re doing it for, that goes a long way. “There are different things you go through when you get castigated about being injured doing X, Y and Z when people don’t actually see what’s gone on,” he added. “People sometimes have an opinion when they’re sat at home and they don’t see the hard work and the graft that goes on in the heat and humidity. “You’ve got to deliver when you’re asked to and you get left out of the side when you’ve not done too much wrong over the last couple of years. Teenage off-spinner Nayeem Hasan took a five-wicket haul on his Test debut but Bangladesh’s top order then slumped to give West Indies hope on a turning track in Chittagong. Nayeem’s 65-run stand alongside Taijul Islam helped lift the Tigers to 324 all out before the 17-year-old took centre stage with the ball on the second day of the opening Test. 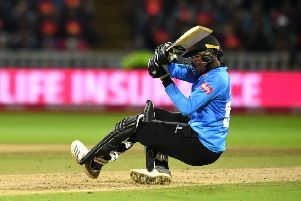 The tourists had slipped to 88-5 but were able to post 246 all out thanks to a counter-attacking 63 from 47 balls from Shimron Hetmyer, while Shane Dowrich made an identical score, from 101 deliveries, before running out of partners. Nayeem finished with 5-61 but his efforts were undermined by Bangladesh closing on 55-5, giving them a lead of 133 heading into the third day.